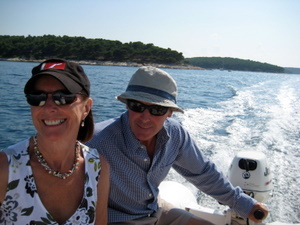 Motored to Hvar. Hung off the town dock @1:00 - Dock master said there were a lot of boats ahead of us waiting to get alongside. He suggested we moor at the entrance to await our luck, but we decided to go back to the islands and find a spot to anchor. 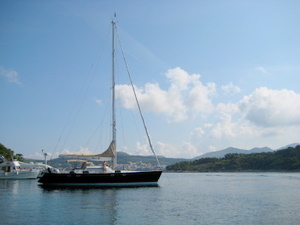 Anchor on the east side of Planikovak in 12m and run a line ashore to a rock on the beach. The rocks on the shoreline are very sharp and we could have easily pierced our dinghy. Wind is light from the SE. 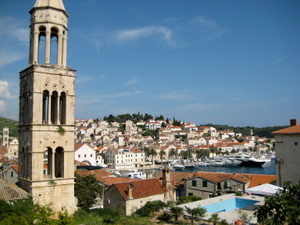 4:00 Boat secure we take dinghy into town - 8 minute ride. Wander the town checking out restaurants and decide to go back to the Park - beautiful terrace above the end of the harbour where we had a lovely dinner 3 week earlier. Head out to the Hula Bar on the west of town to catch the young crowd scene - sun bathing on the rocks, pina coladas, disc jockey - great time being had by all.